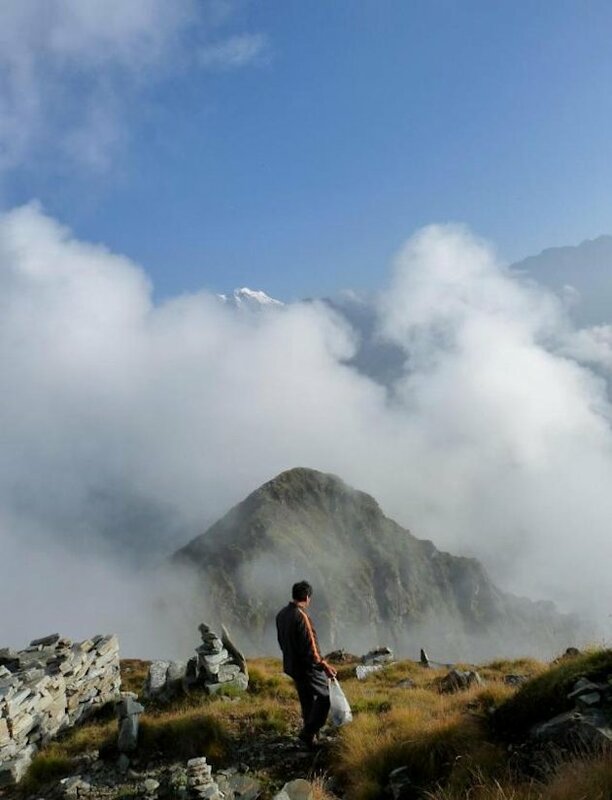 The peak of Chandrashila, cloaked in fog on this autumn morning, looks out at a panorama of mountains. 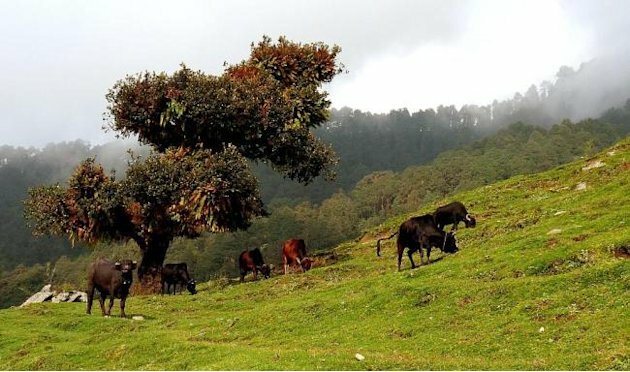 Chandrashila is 13,000 feet above sea level. 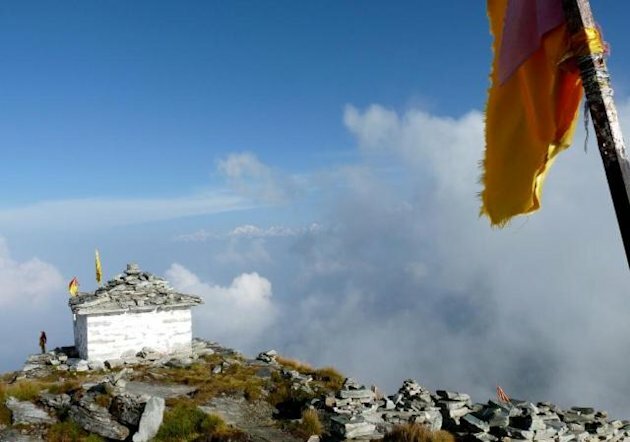 The Tungnath temple has withstood the continuous assault of the elements. 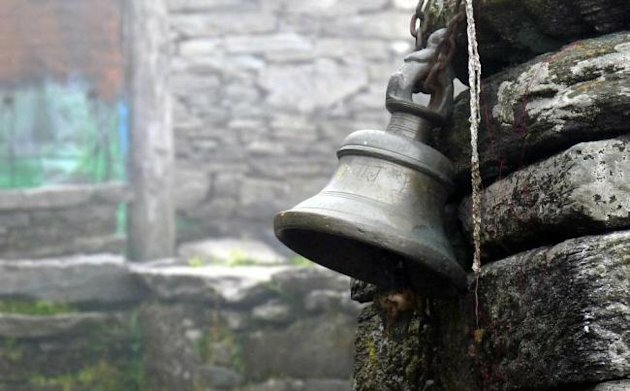 A bell rests against the stone wall of the temple. 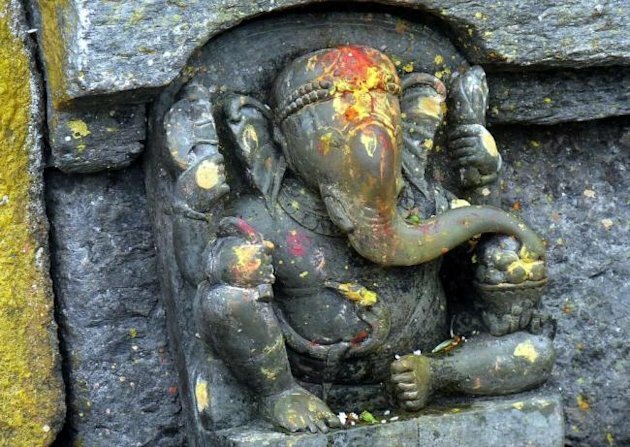 A relief of Ganesha carved on the temple wall. Continuous exposure to wind, rain and snow has left scars. Shopkeepers and mule drivers make conversation outside the small snack shops, which double as lodges. 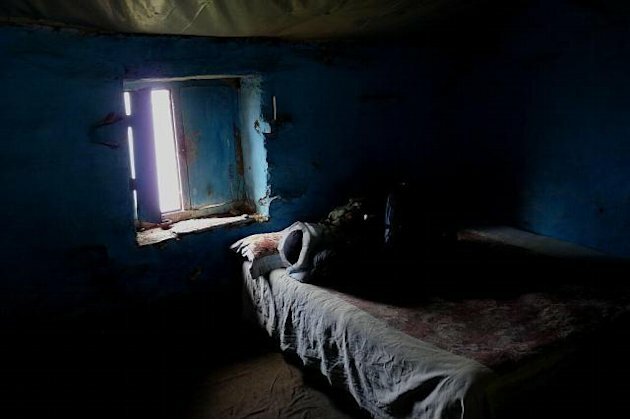 Most have one or two tiny spare rooms, rented out for the night. Common toilets are available but they are terrifying. Our room at Devloke Hotel, with a view of the mighty mountains, was not uncomfortable. For safety and warmth, we tucked into our sleeping bags. At night, we heard rats on the roof. Our host Naveen assured us that they were harmless. 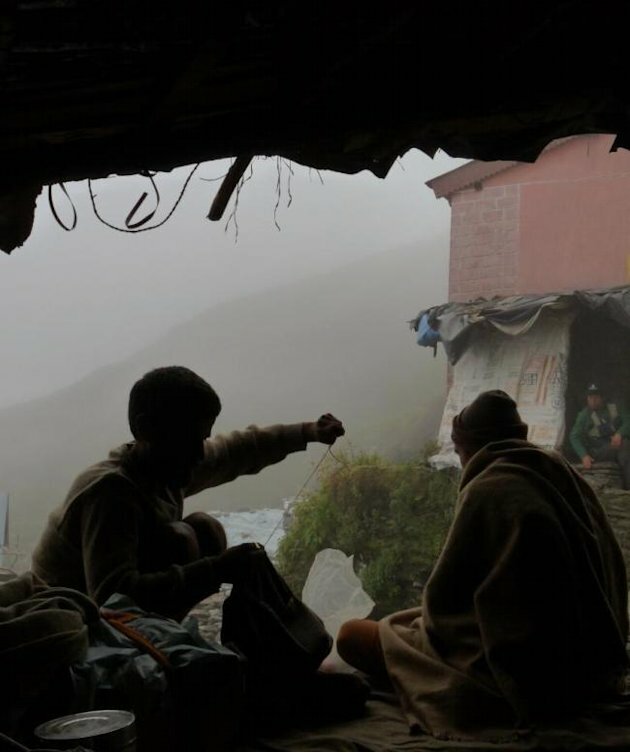 Two sadhus joined us at breakfast and began to smoke a chillum, after which the younger of them began to stare at the mist in silence. The elder sadhu proceeded to sew a tunic from a length of sack. 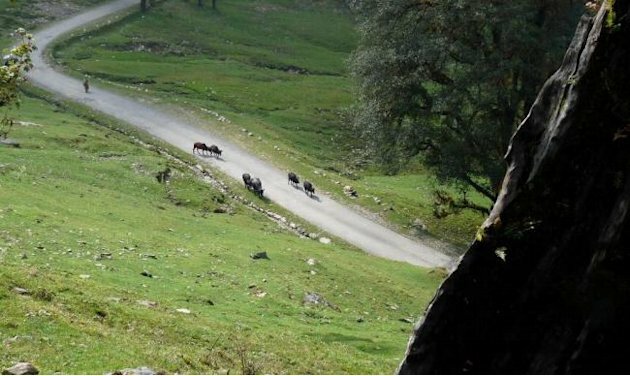 They told us that they were on their way to Badrinath, 140 km away by road, on foot. When we expressed our surprise they told us about an old path through the forest that a few sadhus still frequent. We saw them seven days later on the road to Badrinath. Inspired by the story, we decided to go looking for the trail. 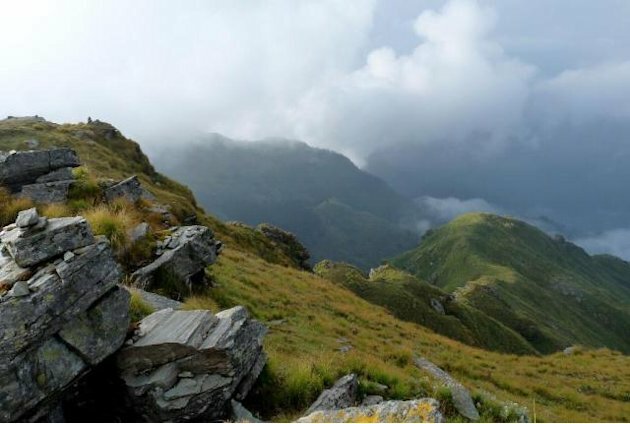 From Akashkund, believed to be a source of rivers, a stream meanders downhill towards Chopta. Along the trail we came across a simple farmer’s hut set in a forest glade beside a brook and with a cucumber vine bursting with bright yellow blossoms. There were no dangers along the way. We were told to watch out for Himalayan Black Bears but none came to meet us. However, a herd of grazing cows and buffaloes showed interest and we had to hurry on quickly. 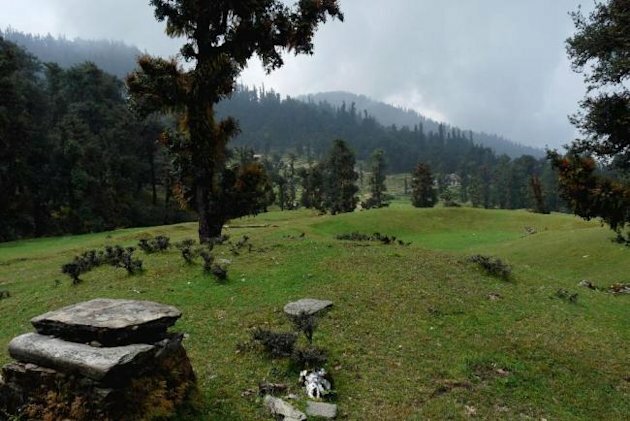 We scouted the foothills of Chopta for the ancient pilgrim route. It was a footpath, and most of it was overgrown with vegetation. Yet, remnants of it were still to be seen at this meadow in Dugalbitta. 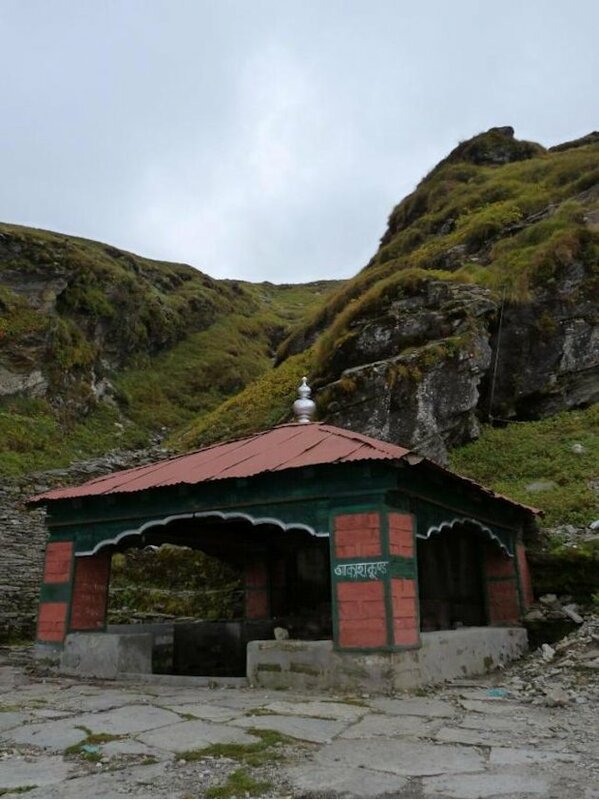 The pilgrim trail intersects the road at various points and through a lot of hard climbing we were able to return to Chopta to spend the night. From the trail we saw these cattle return home for night. 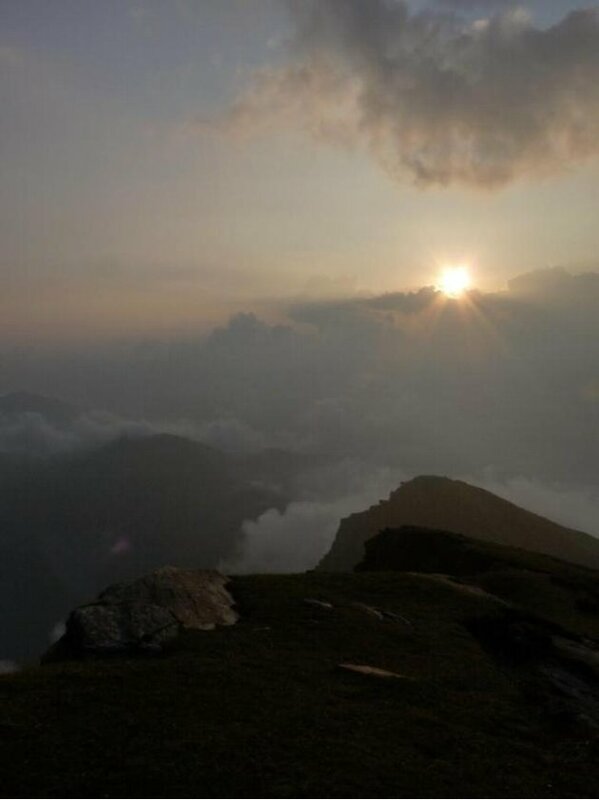 We made haste and arrived at Tungnath to watch the sunset. The next day, we planned to explore the peak of Chandrashila. 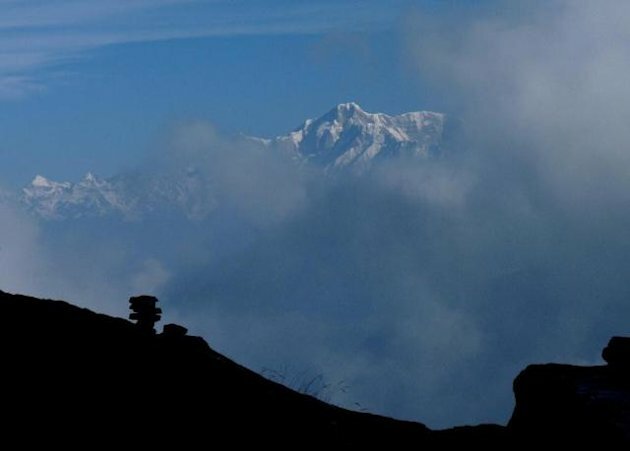 Above Tungnath is a small rocky path leading to a peak called Chandrashila, about 13,000 feet above mean sea level. 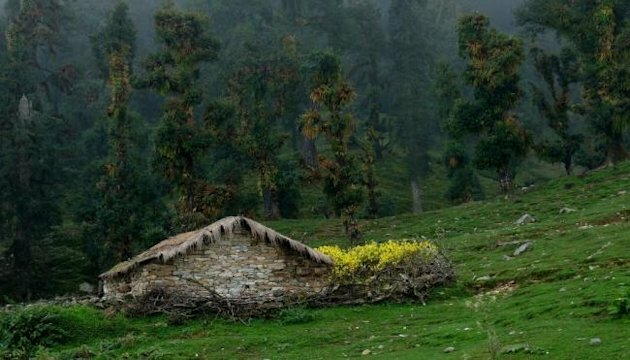 There are no trees here, only rocks and grassy meadows called bugyals. 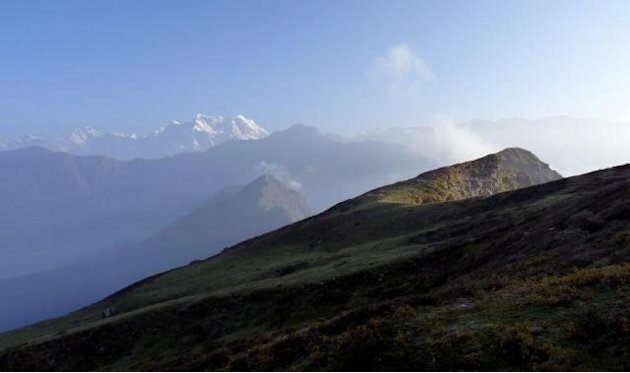 The trail offered us fleeting glimpses of the snow-capped peaks of Kedarnath and Chaukhamba but the mist quickly veiled them. We saw a shape move in the dim light of early dawn. 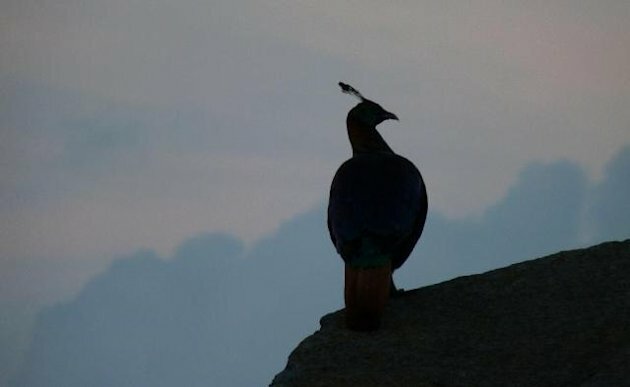 It’s a Monal pheasant, the state bird of Uttarakhand. When it steps into the sun we see its colors — dazzling violet-blue, green and orange. It surely stole the peacock’s thunder. We climbed for nearly 40 minutes, catching our breath every now and then. 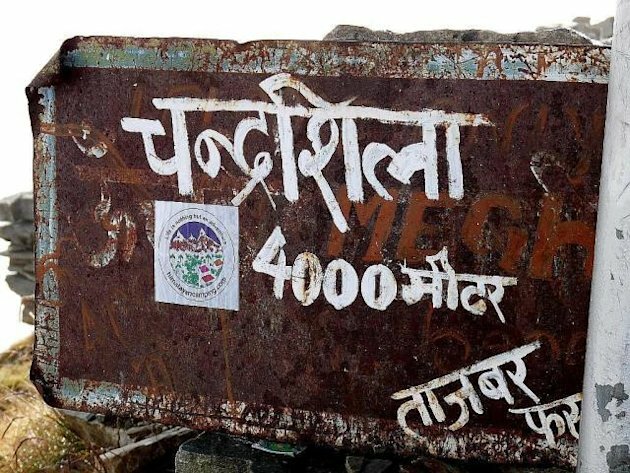 Finally, a rusted, wind-battered signboard announced our destination. 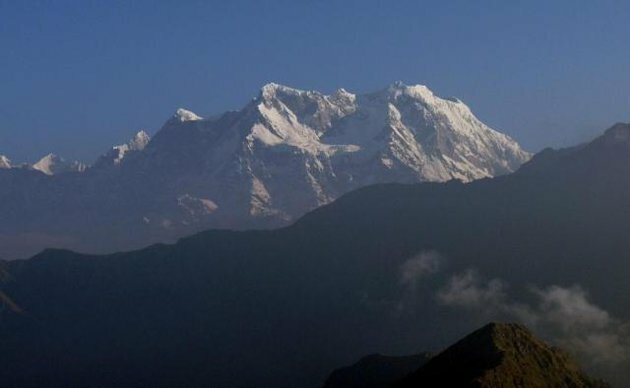 For an instant, the mist cleared and we were offered the breathtaking view of Chaukhamba, its four snow-capped crowns gleaming in the morning sun. 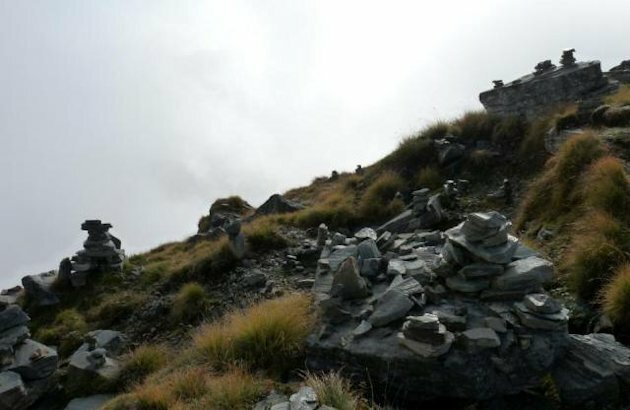 Exploring the peak, we came upon stacks of stones arranged in cairns. Someone was already here, and praying hard. Ahead of us, on the edge of a cliff, a South Korean gentleman aged about 50 meditated on the morning sun. 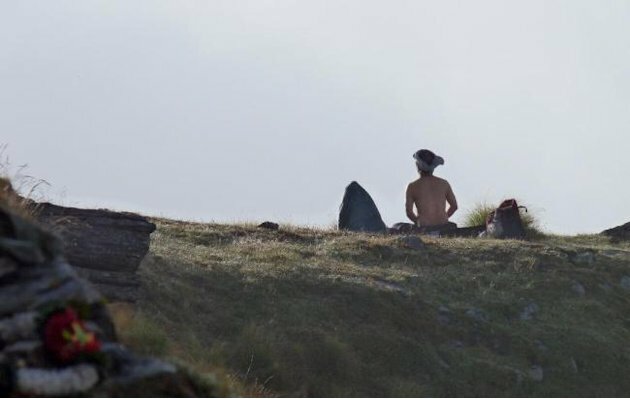 He was shirtless in temperatures that hovered around zero degrees Celsius. Small huddles of chrysanthemum flowers adorned the cairns. Nearby, his companion collected plastic bags and trash left behind by other tourists. The men said they were here to practice mind control. 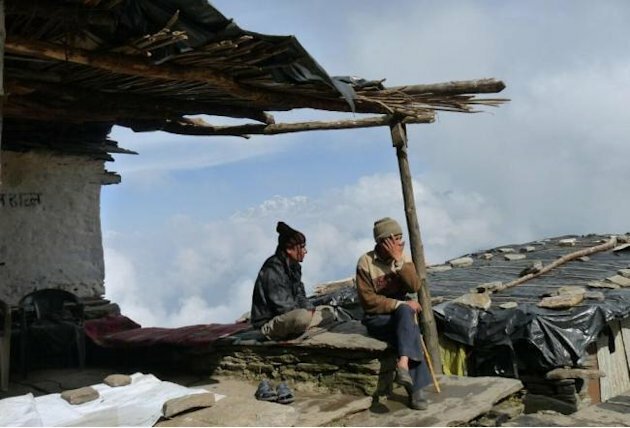 Every morning, they would climb up to Chandrashila before dawn and wait for sunrise. We were moved beyond words. As we watched, more tourists came by, chatting loudly. One of them was eating a bar of chocolate. He suddenly discovered that his cell phone had received a signal and jubilantly announced it to his two friends. They shouted and laughed for a few moments and then the first chap crushed his chocolate wrapper and dropped it on the ground. As we watched them with embarrassment, the Koreans smiled at us and continued cleaning up the peak. 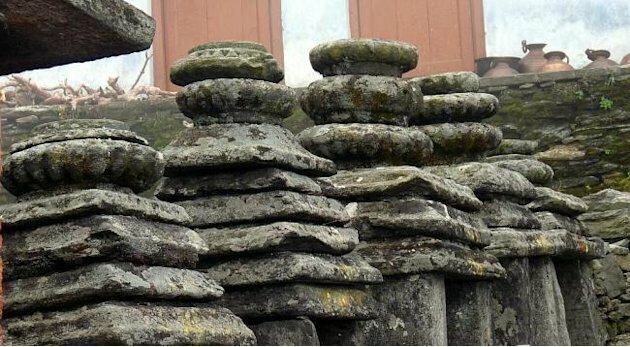 This entry was posted on May 24, 2012 at 1:39 AM	and is filed under Ancient Architecture, Hindu Empire, India Forgotten, Picturesque. 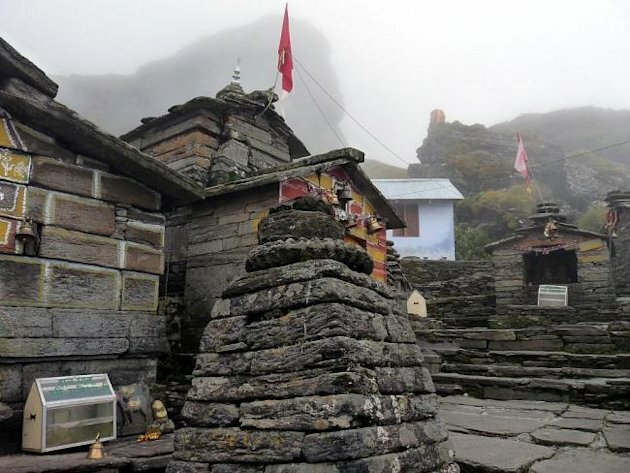 Tagged: Badrinath, Chandrashila, Chopta, Ganesha, hinduism, India, Lord Shiva, Religion and Spirituality, Shiva, Tungnath. You can follow any responses to this entry through the RSS 2.0 feed. Both comments and pings are currently closed.